December’s Animate It Competition – Fly Your Tea Cup! Learn How to Fly Through Space in a Teacup! Find out how you can fly through space in a teacup using this simple animation tip! In this tutorial you’ll learn how to use a green screen, how play tricks with perspective and how to boss around – ahem, direct – your mates! 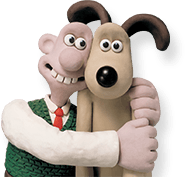 Aardman model-maker Jim Parkyn has been visiting schools across the UK to teach them how to make and animate their own Gromit models using the Animate It! software! Take a look at how they got on – maybe it will inspire you to have a go yourself!